(CNN) -- Former Mexican President Vicente Fox has joined three other ex-leaders of Latin American nations calling for the decriminalization of marijuana. Former Mexico President Vicente Fox says it's time to open the debate on legalizing marijuana. 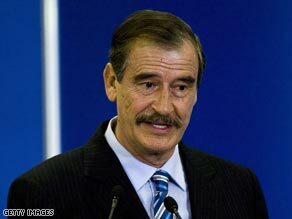 Fox, who was Mexico's president from 2000 to 2006, said the current policy is clearly not working. "I believe it's time to open the debate over legalizing drugs," he told CNN on Tuesday. "It must be done in conjunction with the United States, but it is time to open the debate." He pointed to how the end of Prohibition in the United States in 1933 lessened organized crime violence. Fox was mirroring a position adopted earlier this year by his predecessor as president of Mexico, Ernesto Zedillo, and the former heads of Colombia and Brazil. The three former chief executives are members of the Latin American Commission on Drugs and Democracy. At a February meeting in Brazil, the commission called for the decriminalization of marijuana for personal use and a change in tactics in the war on drugs. "The problem is that current policies are based on prejudices and fears and not on results," former Colombian President Cesar Gaviria said at a news conference in which the 17-member commission's recommendations were presented. Former President Fernando Henrique Cardoso of Brazil said the group called for only the decriminalization of marijuana and not other illicit drugs because "you have to start somewhere." Zedillo was president of Mexico from 1994 to 2000. Gaviria was president of Colombia from 1990 to 1994. And Cardoso led Brazil from 1995 to 2002. Fox said any change in drug laws must be accompanied by an education campaign in schools and homes. And because the United States is a large consumer of marijuana that comes from Latin America, any steps toward legalization must be supported in Washington, he said. Gaviria said in February that the time is right to start a debate on the subject, particularly with the pragmatic openings provided by the election of President Obama. "In many states in the United States, as is the case in California, they have begun to change federal policies with regard to tolerating marijuana for therapeutic purposes. And in Washington there's some consensus that the current policy is failing," Gaviria said. The call for a change in strategy comes amid a horrific explosion of drug-related violence in Mexico, where officials say 10,000 people have been killed since President Felipe Calderon took office in December 2006. Calderon said in a speech earlier this year that 6,500 of those deaths occurred in 2008. Calderon, who succeeded Fox, ramped up the battle against the nation's narcotics traffickers and brought in the army to reinforce often ineffective local and state police. That was a change in tactics from Fox, who said he had chosen to strengthen federal police and intelligence-gathering operations and to create a secretary for public security. But now that Calderon has chosen a different approach, he must prevail, Fox said in an exclusive interview with CNN. "If you go to war, you have to win it quickly and according to regulations," he said. "Human rights are very important." It also is important that the United States "accept its responsibility," he said. "I would like to see some steps taken here in the United States. We see the drugs are coming across the border and are distributed in Atlanta and Washington and Chicago and all parts of the country." Fox's comparison of the current battle to Prohibition in the United States in the 1920s was recently touted by Robert Pastor, who was a Latin America national security adviser for President Carter in the late 1970s. He called the problem in Mexico "even worse than Chicago during the Prohibition era." Pastor said a solution similar to what ended that violence is needed now. "What worked in the U.S. was not Eliot Ness," he said, referring to the federal agent famous for fighting gangsters in the 1920s and 19'30s. "It was the repeal of Prohibition." Others are not so sure. "This has become a world of globalization," said Monte Alejandro Rubido Garcia, Mexico's executive secretary for the National System for Public Safety. "Globalization has many virtues but some errors. I can't conceive that one part of the world would decriminalize drugs because it would become a paradise for drug use. It might bring down violence, but there would be social damage."